I want to answer this question, however, because I wonder about the hopes and assumptions beneath it. 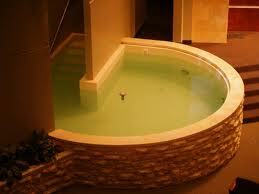 Clearly, we want any baptism to be a “significant” experience. But it’s important to remember that we all have very different understandings of what makes something meaningful. For example, Jane wrote last week about why a family might choose to bring a child to be baptized. For such an act to be meaningful, especially if the child is a baby, then the ritual must correspond to the family’s values. If, for example, the family connects strongly to idea of each of us being “chosen” and beloved by God, then an infant baptism around a font could be very significant. In my view, the clergy’s role is not to tell a family or individual what “should” be done. Rather, my desire is to help others articulate their own hopes, fears, and needs around any aspect of faith life–and to determine how the community can play a role in supporting all of that. So… if someone feel compelled by the concept of immersion, I think that’s fantastic. As a church, we’d need to find a venue for it. Perhaps our friends at University Baptist could help us out. And hey, there are some pretty wonderful bodies of water all around us here in Minnesota….